The CDP Global 500 Climate Change Report 2012 indicates that there has been an increase in corporate sustainability around the world. The CDP assesses corporate risks and opportunities on behalf of 655 institutional investors with $78 trillion in assets. The CDP harnesses the power of market forces to collect information from companies about their GHG emissions, water usage and other environmental impacts. The CDP has assembled the world’s largest collection of primary data on climate change and water. They use this data to help businesses develop strategies, make investments and craft policy. The CDP are powerful advocates of transparency in environmental reporting and they champion corporate strategies designed to reduce CO2 and conserve water. The CDP is an international, not-for-profit organization providing the only global system for companies and cities to measure, disclose, manage and share vital environmental information. The 2012 CDP Global 500 Climate Change report was co-written with professional services firm PwC. According to the 2012 CDP report, a total of 78 percent of companies indicate that climate change is being integrated into their corporate strategies, up from 68 percent last year. The report notes that companies that are leading in sustainability have developed long-term strategies to combat climate change. These leading corporate sustainability strategies look at least a decade into the future. While four of the world’s top ten companies come from Germany, none of the top ten are from the US. As measured by the CDP’s top ten list of sustainable corporations, Germany is the world’s dominate global force. German firms earned almost half of the top ten positions as ranked by the CDP. The company with the highest disclosure score in this year’s analysis (receiving the maximum score of 100) was the German pharmaceuticals company Bayer. The pharmaceutical giant got top marks for its disclosure on sustainability matters and an “A” grade for its actual results. In third place was German company BASF followed by German car company BMW. Both companies earned a score of 99 (out of a possible 100). In the eighth position was the German insurance and asset management company the Allianz Group. All three companies received “A” grades for their actual results. The U.S. has the most companies on the Carbon Disclosure Leadership Index (CDLI), but Germany has four firms ranked in the top ten while the US has none. What makes this feat truly noteworthy is the fact that the German economy is seven times smaller than the U.S. The leadership of German companies should come as no surprise given the government’s clean energy ambitions. Germany is already a global leader in wind and solar. By 2050, Germany is aiming to get 80 percent of its electricity from renewable sources of energy. To help meet this ambitious target, Germany is investing in R&D to pioneer new approaches in solar, wind, energy storage, green hydrogen and bioenergy. The rising number of droughts, floods and other extreme weather events are making the costs and risks of climate change abundantly obvious. Weather-related catastrophes are predicted to increase as the planet gets warmer. The 2012 CDP report indicates that the threats associated with climate change are increasingly being factored as corporate risks. According to the report, a growing number of global businesses understand that environmental concerns represent a “real and present” danger to their operations. The number of companies integrating climate change factors into their overall business strategies rose by 10 percent over the past year, contributing to a reported 13.8 percent reduction in corporate GHG emissions between 2009 and 2012. More than three-quarters (81 percent) of the world’s largest public companies indicate that climate change poses “physical risks” to their business. Risks from climate change include flooding, drought and fires. It is interesting to note that 37 percent of the 405 companies reporting to CDP list those factors as a serious threat, up from 10 percent in 2012. An additional 53 percent also saw risks related to the adoption of new customer habits and perceptions of their firm. According to the 2012 Carbon Disclosure Project (CDP) report, sustainability makes companies more competitive and offers investors better returns. This is driving an increasing number of publicly traded companies to embrace sustainability as part of their long-term strategy to combat climate change. The CDP gathers information for investors about the environmental policies of large companies and the environmental risks they face. The CDP has created an index to recognize the world’s best companies called the Carbon Performance Leadership Index (CPLI). The companies that make it onto these lists tend to generate superior returns for investors. An increasing number of companies are seeing an opportunity in their efforts to manage climate change. For 68 percent of interviewees, climate change presented the opportunity to tap into new customer behaviors or improve their corporate reputation. This number is up from 58 percent last year. IBM is an example of an organization that is working to drive new revenues through green related activities. The company earned 86 points, and a “B” grade, for its eco-friendly efforts. “We do it because it makes good business sense,” said Wayne Balta, vice president, corporate environmental affairs and product safety at IBM. As an example, IBM saved nearly $500m on energy bills from 2000–10. The CDP report indicates that almost half (48 percent), believe that climate change has yielded opportunities for new products and services. However, only a bit more than a fifth of respondents (21 percent) has set aside a dedicated budget for low-carbon research and development. 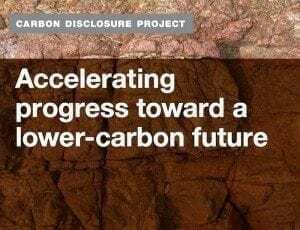 According to The Carbon Disclosure Project (CDP), the average long-term emissions reduction target for the companies covered in their report is just one percent per year. One percent is “well below the level of ambition needed” to ultimately limit the rise in global temperatures to no more than 2 degrees Celsius (3.6 degrees Fahrenheit) above what it was in pre-industrial times. According to PwC, four percent annual cuts are needed to limit global warming. While 82 percent of those responding set emission reduction targets, most of those targets are short-term. Only 20 percent have targets that extend beyond 2020. “Even with progress year on year, the reality is the level of corporate and national ambition on emissions reduction is nowhere near what is required,” said Malcom Preston, PwC’s global lead for sustainability and climate change. The U.S. is the wealthiest nation on Earth, therefore it stands to reason that they should have the most companies on the CDLI. As the world’s economic leader, it is discouraging to note that the U.S. does not have a single company ranked in the top ten. Unlike the German government, the American government, particularly the Republican controlled House, does not support an environment that favors sustainability. There will be no progress on climate and energy legislation as long as the GOP has control of the Executive, the House or the Senate. Although Republicans claim to be champions of business, they ignore the opportunities associated with climate change and mock attempts to promote a green economy. The obstructionism of Republicans means that the business community must cope with regulatory uncertainty and operate in a vacuum. The CDP’s S&P 500 Climate Change report indicates that many American firms are being proactive despite the dearth of sensible environment and energy policy from the GOP. While U.S. corporations may not be in the top ten, the report shows that American firms are improving. The CDP reports that U.S. corporations are narrowing the climate strategy performance gap compared with the Global 500. The leading US firms (Microsoft and UPS) both earned 99 points for their disclosures and a grade of “B” for their actual results. The average disclosure scores among the S&P 500 companies improved by 13 percent. Meanwhile, 15 companies from the S&P 500 were recognized for carbon performance: Ace, Allergan, Allstate, Autodesk, Bank of America, Best Buy, Eaton, Exelon, Intel, Lockheed Martin, North Grumman, NYSE Euronext, Pepco Holdings, Pfizer and Wells Fargo. As evidenced by the CDP report, there is a growing interest in sustainability from the corporate world. Companies are increasingly seeing the wisdom of disclosure and the value of adopting sustainability strategies.